My friend Andrew found a dead beetle under his bed recently. If you know him, you can look up the picture on Twitter. The poor thing is lying on its side, just . . . dead. There are so many different types of beetles in the world. In Asia, beetles are sometimes used for insect fighting - much like other types of animal fighting it is kind of gross. One of the most popular battlers, though, is the Rhinoceros Beetle. They can get pretty big - up to six inches - among the largest beetles in the world. They use the horn on top of their head to chase off potential rivals. Having recently learned this fact, I am going to start bringing a Rhinoceros Beetle with me when I go out on Saturday nights! Wait a minute - who does that Rhinoceros Beetle look like!? It's Heracross. What do you need to know about Heracross? Heracross are good, Pinsir are evil. 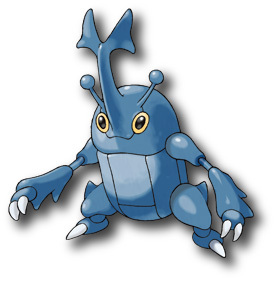 Heracross are the only combination Bug/Fighting-types currently available in Pokémon. The horns of male Heracross end in an X shape, the horns of a female Heracross end in a heart shape. Kidd Starck, if you know him, really loves Heracross. Without doubt, Heracross is a physical attacker with 25 percent of its base stats being in Attack at 125. Special Defense is 95, Speed 85, HP 80, Defense 75, and Special Attack is at 40. Most of the attacks Heracross learns by leveling up are physical - so it is best to put as many EVs into Attack and HP as possible. Toss a few extra onto speed for fun! Any of the Attack boosting natures will work well for Heracross (Lonely, Brave, Adamant, or Naughty) but Adamant will hinder the almost useless/non-existant Special Attack stat. Your best bet in managing Heracross is to focus on the Fighting-type moves and physical attacks. Sadly, Heracross learn very few Bug-type moves, only Megahorn, Struggle Bug, Bug Bite, and Fury Cutter. Your main attack should be Close Combat - 120 base power and 100% accuracy while dripping Hercross's Defense and Special Defense (which don't have much going for them anyways). Brick Break is great for messing with boring old Cresselia (it removes Reflect and Light Screen protections while doing STAB damage). Your biggest weakness is going to be Flying-types so add on either Stone Edge or Rock Slide. There are a lot of status moves available that will raise Defense, you are probably better off just adding on Protect. Heracross can come with three abilities: Swarm, Guts, or Moxie. I'm somewhat biased against Swarm and Guts - they rely on a losing strategy. Moxie is pretty awesome if you can get your hands on a Dream World Heracross - it makes that Attack stat even better as you clip off opponents. If you think you can make your Heracross a quick killer, you could outfit it with a Life Orb, but that base HP stat is kind of low. You might be able to balance this with some EV training if you want. A Zoom Lens might also be worth considering if you are expecting Heracross to be one of the slower Pokémon on the field (Zoom Lens and Wide Lens both make Fury Cutter an interesting move to consider on your battle bug). There will be a Heracross card available in the Boundaries Crossed expansion for the TCG being released in November. 100 HP isn't horrible but the energy cost of attacks is a little high. If you have nothing else available, though, Heracross can OHKO a Noble Victories Terrakion. Please remember, the only time you should make bugs fight each other is in Pokémon games. Rhinoceros Beetles are for friendship!